Welcome to Five Little Bears in Gatlinburg! 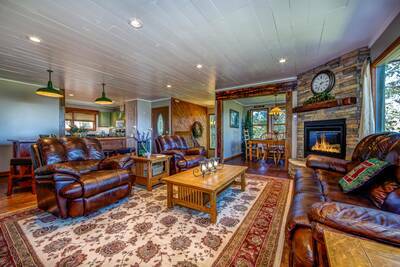 This 4 bedroom, 5 bath Smoky Mountain cabin rental is the perfect place to enjoy an unforgettable vacation with your friends and family. As soon as you enter this unique and magical cabin, you’re greeted by luxurious amenities and fantastic furnishings. The open and spacious living room provides you with a mountain stone accented fireplace, ample seating, flat screen TV and deck access. The fully equipped kitchen has everything you’ll need to prepare, cook and serve a delicious meal while vacationing in the mountains. Nearby is a wonderful breakfast nook that’s the perfect place to enjoy a cup of coffee or to sit down with your favorite book. Next to the kitchen, you’ll find the formal dining area where you can gather around the table with your friends and family to share stories and enjoy a delicious meal with one another. On the main level you’ll also find a full wheel chair accessible bath with tile accented shower. Head up to the second story of Five Little Bears and you’ll find the first beautiful master suite. This luxurious bedroom boasts a private bath with jetted tub, log king bed, deck access, cathedral ceiling, flat screen TV and sitting area. The second wonderful bedroom located on the upper floor features a queen bed, flat screen TV, deck access and a private en suite full bath for added privacy and convenience. The third bedroom on the second floor is truly a special place for the little ones to enjoy! Here they’ll find two sets of bunk beds with trundles, flat screen TV and their own private en suite bath. Venture to the lower level of Five Little Bears and you’ll enter the second living room and gaming area. Here you’re treated to a fireplace, flat screen TV, additional comfy seating, air hockey table, stand up arcade game and access to the lower level covered deck with a bubbling outdoor hot tub. Also located on the lower level is the second master suite bedroom with log king bed, flat screen TV, private bath with jetted tub and deck access. 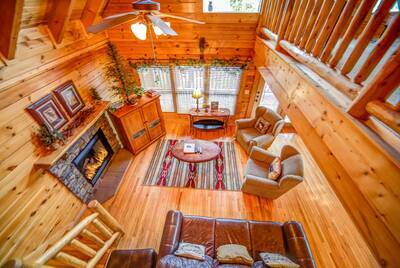 This amazing Gatlinburg cabin rental features 4 decks for you to experience the crisp, fresh Smoky Mountain air. Outside you’ll find a picnic table, rocking chairs and patio seating. Located just a few minutes from downtown Gatlinburg, the Great Smoky Mountains National Park and seconds from Ober Gatlinburg Amusement Park and Ski Resort, you’ll be near all the fun and exciting things to see and do in the Smokies! In the warmer months, be sure to pack along your bathing suit and pool toys so that you can visit the resort swimming pool! Don’t forget to pack along your laptop or tablet while vacationing at Five Little Bears so that you can take advantage of the complimentary high speed wifi internet. With it’s abundant amenities, spacious floor plan and great location, you’ll love your Gatlinburg getaway at Five Little Bears! 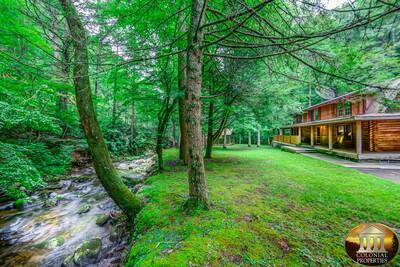 Reserve your Smoky Mountain vacation today! A: Hi Tabatha! Five Little Bears is not a pet friendly property. We do have other properties on the program that are pet friendly. A: Hi Darlene! There is a charcoal grill at this cabin. A: Typically, the pools close for the season around Labor Day. “ We had an amazing cabin experience and would recommend this cabin to friends and family. We were looking for a weekend getaway and it was perfect. Everything was provided in the cabin. Thank you! 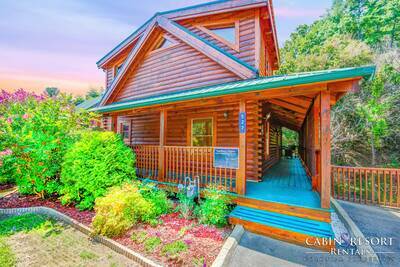 “ A very nice cabin with plenty of space and activities. Beautiful location on the mountain. “ We have been staying with Colonial Properties in Gatlinburg and Pigeon Forge every summer for 5 years. This cabin was our favorite. 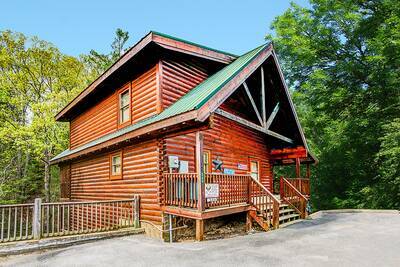 Great location, wonderful cabin and lots of room. We saw bears every day (which was awesome). This is a cabin we will definitely rent again.